Each IOU has 16 I/O card slots. The slot numbers repeat from 1 to 16 in each IOU, so to identify the physical location of a card you must specify the IOU number as well as the card slot number. 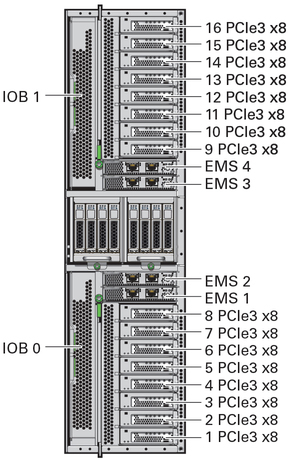 This illustration shows the locations of the card slots (also known as PCIe carrier slots) in an IOU. Note that the physical numbering for I/O card slots starts at 1 (not 0) and ends at 16 (not 15).